DSC02761, a photo by CAKE Amsterdam - Cakes by ZOBOT on Flickr. 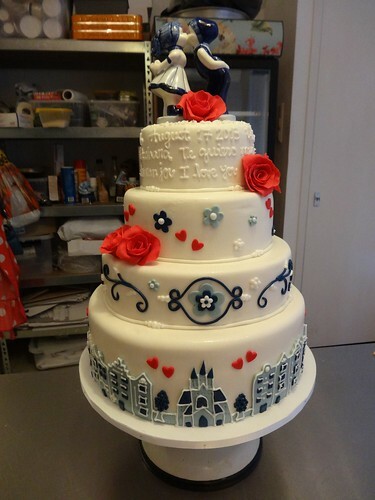 Delfts Blauw inspired wedding cake with Amsterdam houses on bottom layer with the Vondelkerk featured in the middle (the wedding ceremony location) and red sugar roses. Congrats to Ashara & Guido! FLAVORS : Banana cake with chocolate buttercream and chocolate cake with vanilla buttercream and caramel.